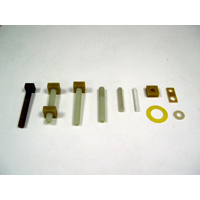 Goodwill FRP bolts, nuts and washers are an alternative to the traditional steel products. Compare to steel products, FRP bolts, nuts and washers have the advantage of corrosion resistant, low water absorption and low thermal expansion. Length of the bolt, thickness of the nut, washer and w. across flats or other spec. and standard can made as request. Size P T. W.across Flats T. O.D. I.D.